exporter ,tropical fish, freshwater fish, aquarium fish, breeding farm, koi, discus, betta, cichlid, Thailand. BAP We are biggest collector and trading company that supplies high quality of tropical fish in southeast Asia base in Thailand. We are specialized in export live freshwater tropical fish from Thailand We are experienced for export lives tropical fishes and water plants since 1996 accepting by all customer (importers and transshippered) worldwide including USA , Europe , and countries of the Middle East . Its quality , size , standard of packing and transportation ensure customer of their satisfaction at all cost . our experience can guarantee you for safety, secure and on time delivery and we have the most species of fresh water fishes for your request and reasonable price. Our company pass control the quality of farm for export from Inland Aquatic Animal Health Research Institute, Department of Fisheries of Thailand, Exporter registered and Farm registered no.TH1031060056 .That confirmation the quality of all fish and aquatic plants from our company. 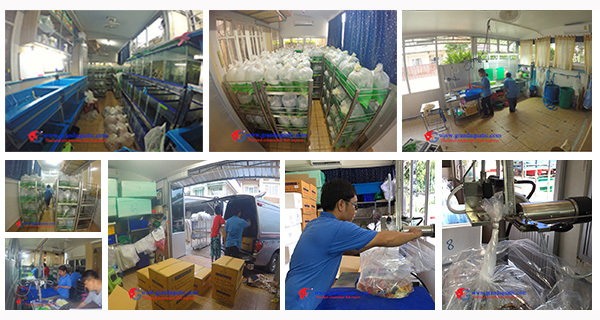 We have 2 single packing machine for packing Betta fish , Discus fish , African cichlid and some of serious fish on transportation. That be sure our customer receive fish on good conditions for business.